I was recently invited to pen the introduction and the conclusion to this Eye For Transport packet on 3D printing. Is 3D truly over-hyped, or could we be on the verge of the next “Industrial Revolution?” Download the packet and see what others think, and be sure to share your thoughts in the comments. In addition to my thoughts shared in the packet, I wanted to mention a few other thoughts. What strikes me, as I consider the advances in 3D printers over the past 10 years, isn’t the move of the printers into the home. That’s interesting, but perhaps a distraction. The real innovation, and advancement, is the diversity of materials that are now able to be printed, and the nearly limitless range of items that can be printed. 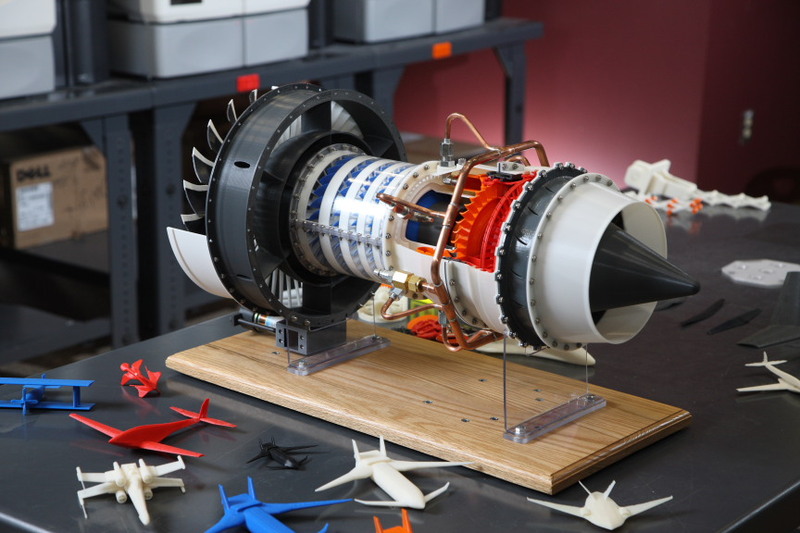 The photograph here comes from an article that highlights the development of a 1/4 scale jet engine that actually turns at over 2000 RPMs. Interesting concept, is it not? One of the more interesting uses of 3D printing, or “Additive manufacturing technologies” is the application for reducing or eliminating many of the barriers hindering the ability to acquire parts today. For many systems (aircraft, cars, even boats and models) the want of a simple part can turn an valuable classic or antique into a dust-collecting display. Often the original manufacturer has gone out of business, the plans for parts have been lost, or simply the cost of manufacturing the small quantities needed makes the process cost-prohibitive. Additive manufacturing can change all this. By using tools (such as laser measurement) to develop 3 dimensional models manufacturing can significantly automate and accelerate the reverse engineering process. The “total cost of ownership” can be significantly reduced by eliminating tooling investments required for unique parts, printing “on demand” within extremely short time lines, and being highly responsive to demand fluctuations. The same 3D laser measurement tools mentioned for reverse engineering can then be used for quality control ensuring a high quality post-production inspection. Finally, additive manufacturing can even improve the quality of those parts that must be manufactured through traditional casting and mold processes. The additive manufacturing process can produce molds and casts that will eliminate traditional mold/casting production limitations and greatly improve the final quality of the product through, for example, conformal cooling.